The Kal Bhairava Temple in Ujjain, Madhya Pradesh has Bhairava, that is Lord Shiva in a fierce form as its presiding deity. He is mainly worshipped by Kapalikas and Aghoras. The deity is offered liquor. 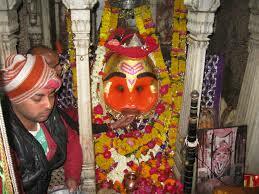 The keys of the temple are kept at the temple premises at night as kal bhairava is the guardian of the temple. Devotees believe they would be saved from the dangers occurring at night if they offer a garland of cashew nuts and light a lamp at the temple. Dogs are offered food and taken good care as they are considered as the vehicle of kal bhairava.